Our Easter celebrations started long before Easter this year with a special visit from my mother. Since she wouldn’t be with us for the Easter weekend we stretched Easter out for the whole week with the kids. It turned into one long Easter week. My mother is the queen of cookies and baking with all her grandkids. It was such a special time this Easter as it was the first time my kids have been old enough to join in and help Grandma bake cookies. Buba, Grandma and I made some delicious frosted sugar cookies that I really couldn’t stop eating all week. If you saw on my instagram you would have seen the adorable bunnies we made, and you would have known how delicious they looked. The Easter egg cookies below were just as good and even the neighbors got some as a treat. 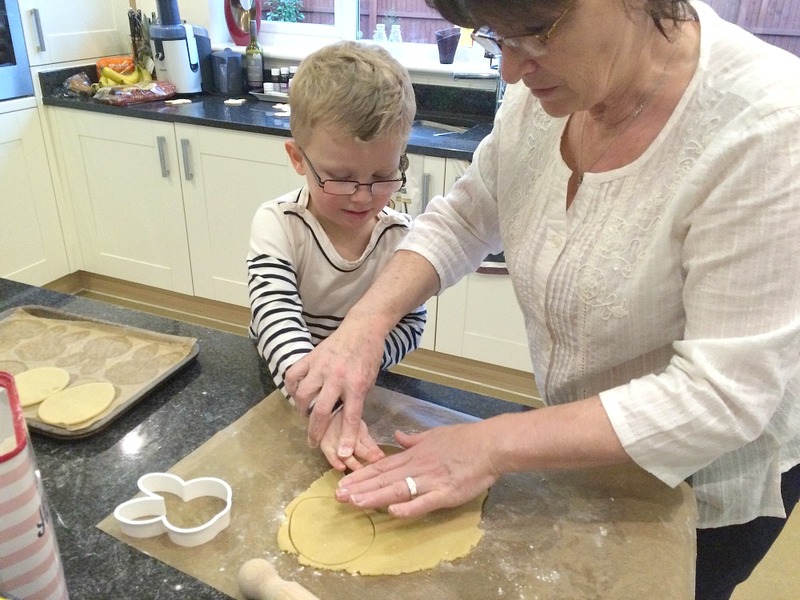 It was lovely watching my mom bond with Buba and bake together. I look forward to the kids helping Grandma more in the kitchen this summer when we go visit. I have so many memories of baking with my mom in the kitchen and I love that my kids will now have their own memories with her too. Easter is so much about family as it is about religion. I love that she could be here Easter week with us to celebrate. Grandma even got to attend music class with us which had an Easter craft theme going on. 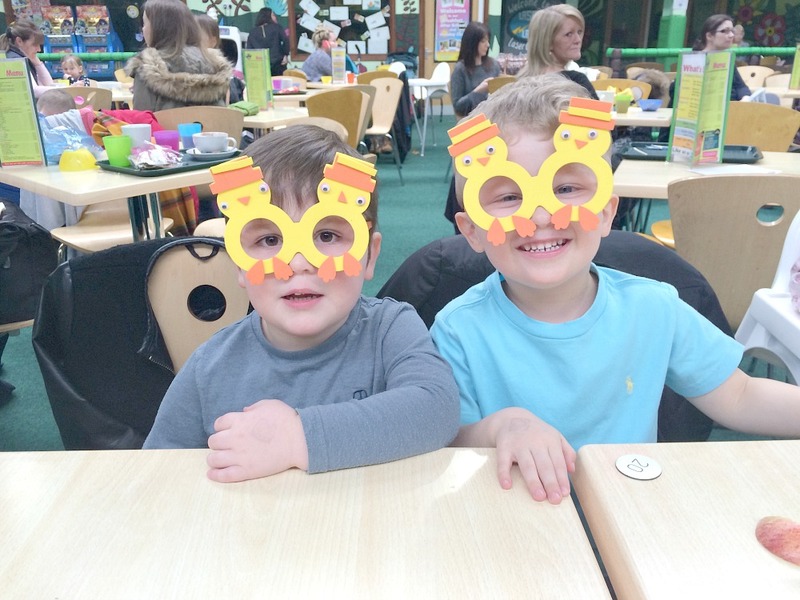 Buba got to make little Easter glasses with his best friend, E and both E’s Nanny and his Grandma sat and helped him put it all together. It’s lovely to make memories with friends as much as family. Our Easter weekend was a simple one but those always seem to hold the best family memories. We got dressed up and went to church and since the kids are still young we thought a local park egg hunt would be overwhelming so we opted for a smaller back yard egg hunt in our own yard. I enjoyed hiding the eggs while the kids took their nap. They were squealing with delight when I handed them their Easter baskets and said go find the hidden eggs. Missy Moo didn’t quite get it yet but Buba was more than happy to show her what to do. He was fair putting so many in her basket as much as in his own basket. 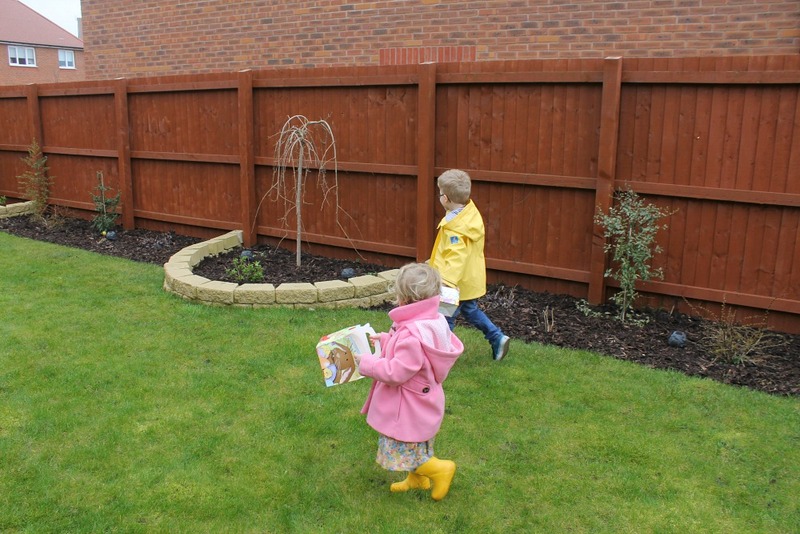 It was our first official egg hunt as a family and Mr P and I sat back and watched them squeal back and forth across the garden. I love that my kids are easily pleased. They didn’t need the eggs to be chocolate or filled with toys. They didn’t need fancy egg hunts set up. 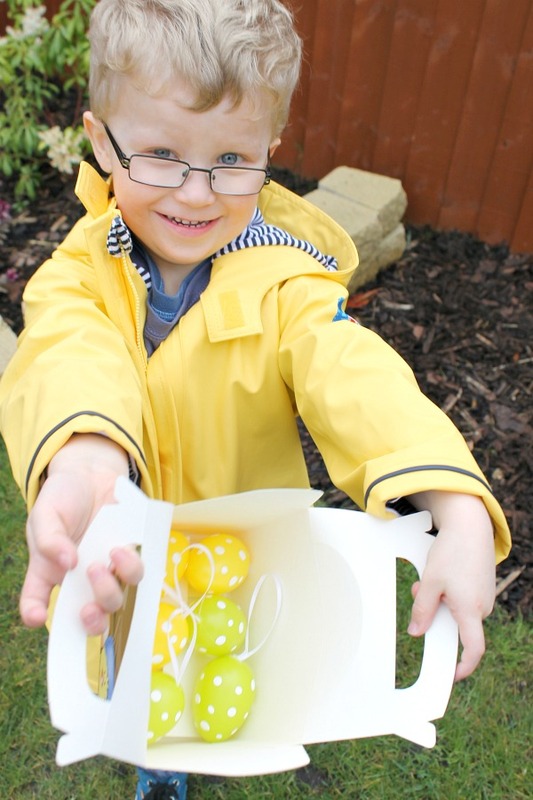 It was just the mere surprise of the hidden eggs and running around seeing how many there could collect. Buba could wait to count his eggs on the patio table. I used just little plastic eggs that we decorated our dining room twig tree with so they were multipurpose. I found a bag of these at our local garden centre so cheap. I even used Easter lunch boxes for their baskets. They didn’t care that it wasn’t a fancy wicker basket or that the eggs didn’t have toys in them. They had just as much fun minus the sugar rush with these and I loved that I can use them again next year. The kids ran around the garden chasing bubbles that I bought and climbing their double slide. Mr P and I relaxed in the lovely sun that was shining and caught up. It was lovely that he could take off Easter week from work. Our scheduled has been so crazy lately and it was nice to just completely relax with no agenda. I love sitting outside chatting with Mr P while the kids play near us. It’s what I have always envisioned my family life would be like and I am grateful each and every day for it. Missy Moo was so intrigued in her egg hunt. 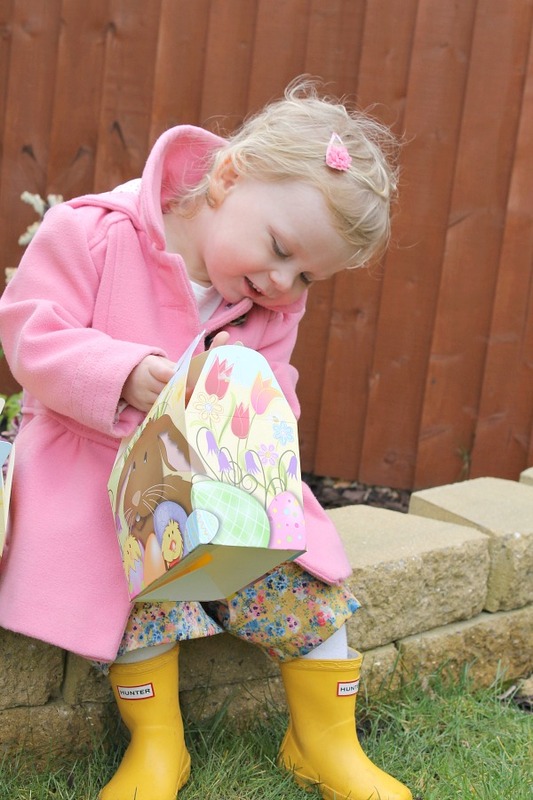 Once her basket was full she ran around putting the eggs back behind plants and shrubs to do it all again. While her brother knew better and sat counting and playing with them at the patio table. We took full advantage of the Easter sales and went to our local garden center and bought some lounge furniture and a patio table with a fire pit in the middle as a treat for ourselves. We spent the better part of our Easter weekend with the fire lit and us cuddled around it long after the kids had gone to bed. I love that Mr P and I can sit without speaking and still be comfortable together. He read his book and I worked on my laptop while the fire cracked between us. It was blissful. On the Easter Monday we kept the family fun going with sidewalk chalk. We got so lucky with the weather so we were making the most of it outdoors. After a very competitive neighborhood shake down of the game “curbie” between the kids (*cough, adults) we took over the streets with chalk. There is nothing better than hopscotch and chalk doodling. The kids couldn’t believe Mommy was drawing on the sidewalk outside. It brought back so many memories of my childhood. 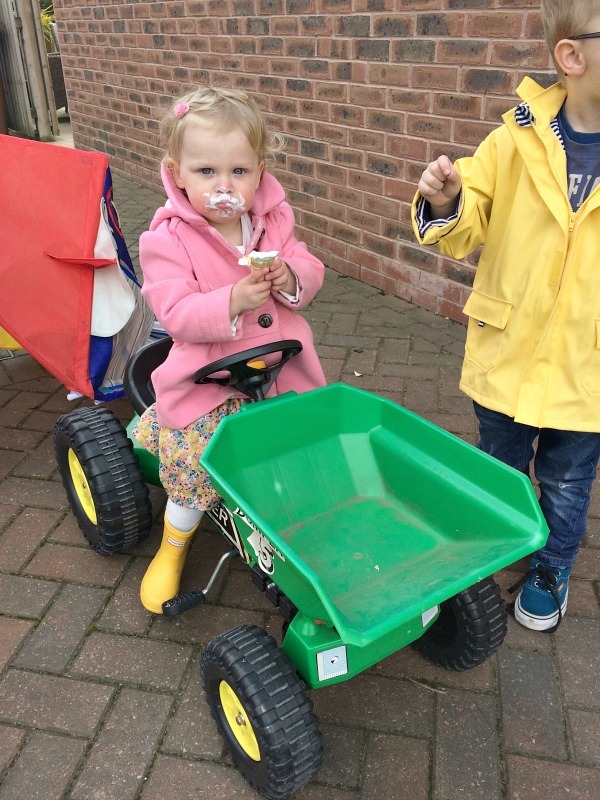 I am known for my strict routines and healthy diets for my kids but I am still human and our weekend was going so well I broke down and let the kids have ice cream. Gasp! I know! 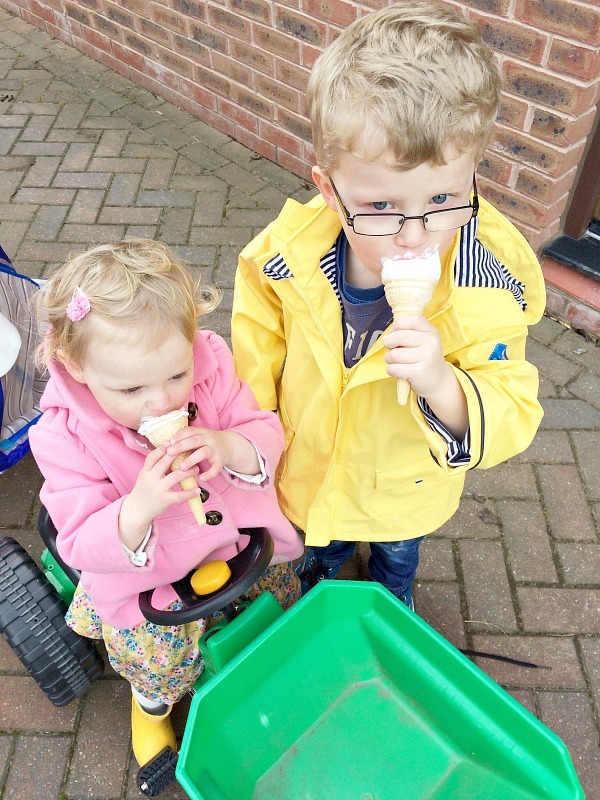 It’s only the second time I have ever let them have a go at an ice cream cone but even worse it was right before dinner… I hope you didn’t fall off your seat just then, I know when I look back I do. But they don’t get Easter chocolate eggs so I felt a little guilty. As you can see from MM face she utterly annihilated her ice cream cone in minutes. She couldn’t even get off the toy tractor she was driving to eat it. While I was going to only have them share it there was no prying that cone out of her hand until it was completely gone. It won’t happen often but I am pretty sure the kids thought they won the lottery or that Mommy hit her head on something. It was an amazing family Easter weekend together and so many memories made and phones and laptops put away. 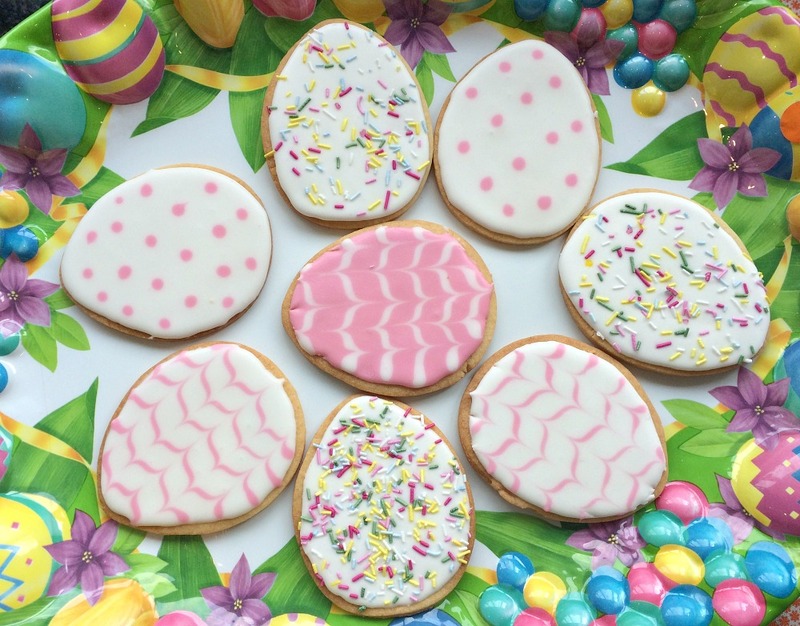 I baked up a storm like these Easter snickerdoodle cookies below and I let my strict routines and organization go out the window for the weekend and it felt AMAZING! Life is too short not to live it to its fullest. I hope everyone has had a great Easter 2015 and I can’t wait until next year when the kids are a little older and I can pull out more Easter crafts and baking and really put the egg hunt skills to the test. It’s the time of year again…. 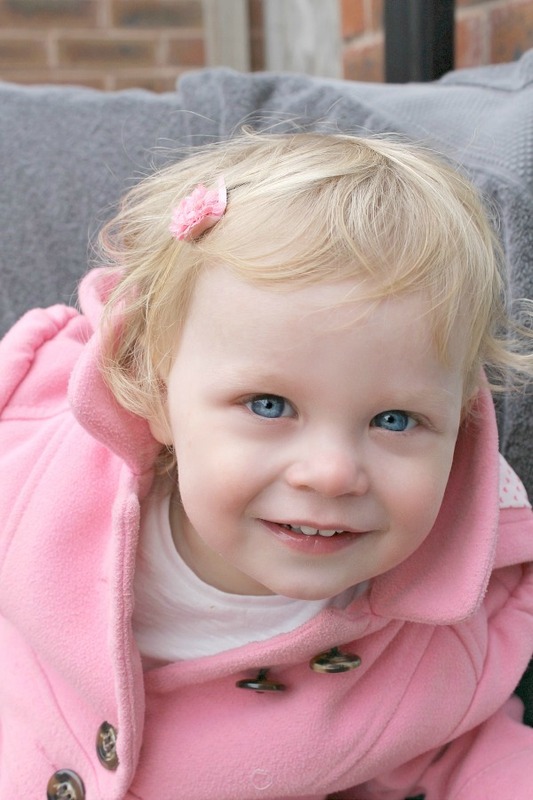 Please vote for Let’s Talk Mommy for the Bibs2015 Awards for Writer & Family! That looks like a truly fun and yet relaxing time. I love those cookies, they almost look too beautiful to eat. It was blissful to just hang out around the house and be outside and enjoy our back garden for once and the family all around us. Oh bless you, me too It doesn’t happen here very often we are always going to the states instead but its lovely for her to see where we live and the kids in their environment. Looks like it was a great Easter for you all. I love the photo of the 2 of them with your mum., and those egg cooking looked amazing. Thanks Emma. Oh yes my mother is queen of baking. I really need to up my game to win with my kids after eating grandma’s cooking. 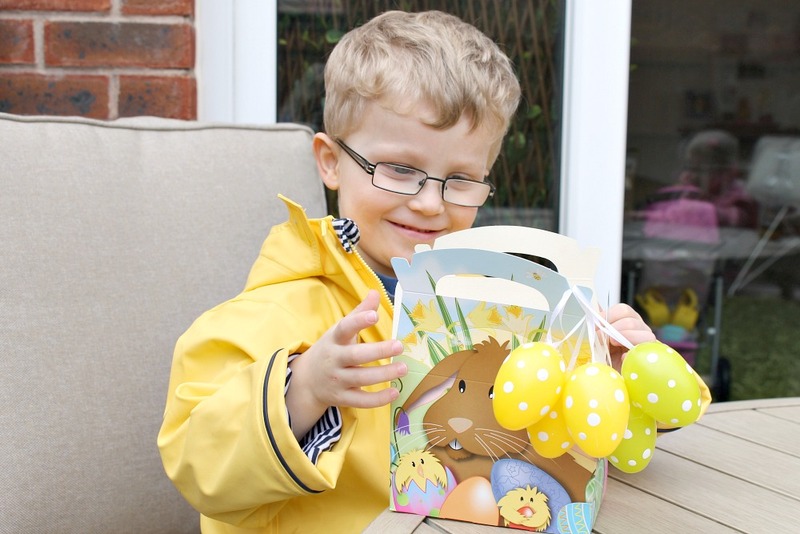 It sounds like it was utterly wonderful and I love that you had plastic eggs – my inlaws set up an amazing egg hunt for the girls but we’re still trying to smuggle the chocolate out of the house!! Hahah my friend did that when the kids went to bed and gave the neighbors chocolate instead. Lol. We had a great time. Thanks Carie. Glad you did as well. Thanks Hun. Oh yes I agree. We got lucky with the weather too and had a brilliant family weekend. Thanks hunny. It was the perfect easter weekend because we didn’t plan anything just went with the flow and lots of family time together. Stunning photos!! Looks like you all had a fab Easter. Those cookies and cakes look delicious! Thanks Beth. Yes we were ever so lucky with the weather weren’t we all? Lovely Easter weekend. A lovely post Jenny for so many different reasons. 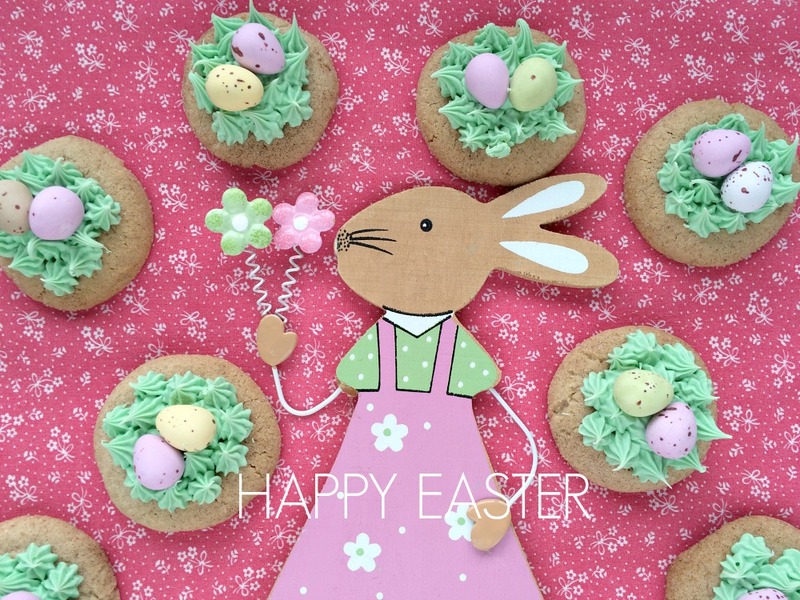 Firstly the egg cookies you baked with your Mom look amazing- you are all so talented at baking. Secondly the fun and happiness that you talk of when they were playing in the garden hunting for eggs- ours were chocolate but like you say, they don’t care about finding them so they can eat them, we found all the chocolate ones and then are saving them up for the next few months- it’s just about the excitement of finding them. That close up photo of MM is just gorgeous too. Thanks Katie as always your comments are heartfelt and sweet. MM is growing up way too fast. 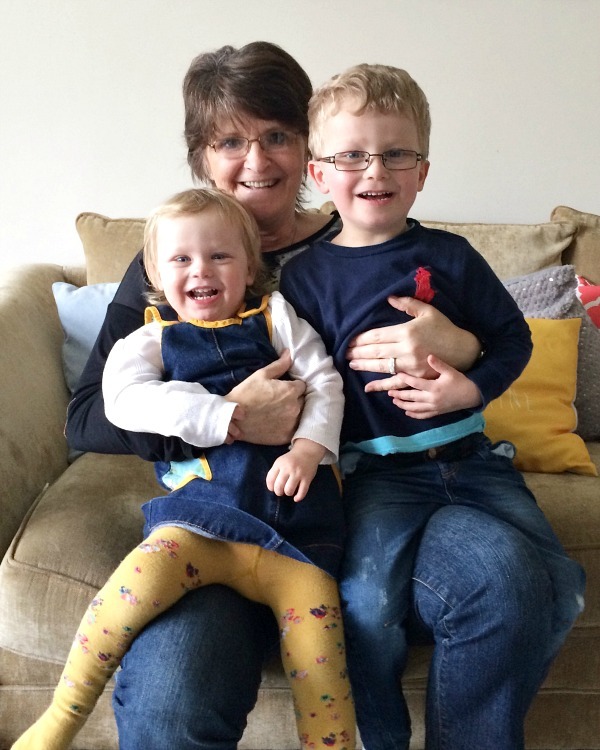 The kids had a brilliant Easter and I am glad my mother was here for the beginning of it. She is way better in the kitchen then I am. This summer I am on a mission to up my cooking skills from her. Thanks Natalie. It’s a favorite of mine but I say that alot I am bias. lol Her eyes are so blue these days. Cookies were fabulous I could have ate the whole dozen. Aww it sounds like a wonderful Easter week! Those cookies look amazing. I’m wishing I was your neighbour just now LOL. I love the idea of the pavement chalk! Never thought of it before! Sounds like you had a wonderful weekend.. You really look like your mum! Thanks Anna Marie. I have never been told that. She would love to hear it though. She always wanted me to look like her. Hahaha yes get yourself some sidewalk chalk from asda. So fun. Thank you Vic. Love it. Now only if I could bake and not gain weight that would be amazing.